British Cyclist Chris Froome Wins Tour De France : The Two-Way The 30-year-old repeats his 2013 victory, beating back a late-stage attack by Colombian Nairo Quintana. Team Sky rider Chris Froome of Britain, with the race leader's yellow jersey, celebrates his overall victory on the podium after the 109.5-km (68 mile) final 21st stage of the 102nd Tour de France. 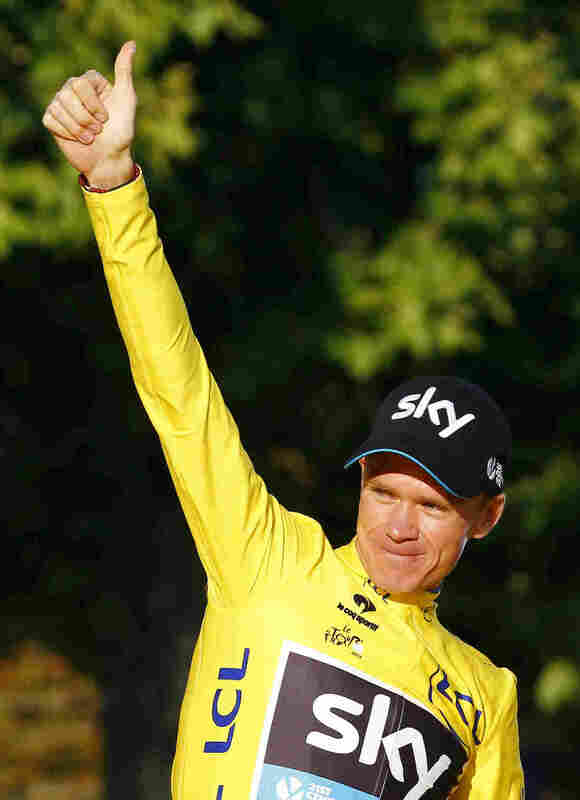 British cyclist Chris Froome rode to his second Tour de France win in just three years on Sunday, edging out his toughest rival, Colombian Nairo Quintana. The Guardian reports: "The final stage was effectively a procession, with Froome enjoying a customary glass of champagne on his bike with around 100km to go. Froome was officially declared the winner of this year's Tour when the riders came into Paris for the first time, before they embarked on the first of their 10 laps of the Champs-Élysées after the finish was [neutralized] due to bad weather." Froome, 30, who was forced to abandon the iconic race last year after falling in treacherous conditions, held the yellow jersey on Stage 4 and again on Stage 7 onward after losing it to Tony Martin. SB Nation writes: "His signature attack was a furious climb up La Pierre-St. Martin on Stage 10, during which he opened his lead from 12 seconds to 2:52 over Tejay Van Garderen." "From that point onward, Froome was a marked man, but any attacks against him fell short. Froome himself was magnificent, of course, but so was [his] Team Sky. During the Stage 12 climb up to Plateau de Beille, Richie Porte and Geraint Thomas successfully closed gap after gap with Froome in tow, allowing Froome to then attack on his own in a show of force to his rivals, ultimately forcing a stalemate. "The next decisive days came at the very end of the Tour in the Alps. On Stage 19, Froome was perhaps truly vulnerable for the first time, losing his lieutenants to the early climbs and being forced to fend off every offensive himself. Nibali attacked him to win the stage when Froome had a mechanical issue, and Quintana was able to wrest 30 seconds away on the general classification, but Froome was still in strong position heading into the Stage 20 climb up Alpe d'Huez, 2:38 ahead of second-place Quintana." "Inside the last 10km (6 miles) he had to stop to remove a paper bag that had got caught up in his gears, while moments later he rode over a discarded water bottle. If either had caused him to crash and not cross the finish line his title would have been cruelly taken away. "However, he stayed upright and rode over the line arm-in-arm with his Team Sky team-mates several seconds behind the main bunch."